Morris can almost always be counted on to promote the gospel of the GOP and his very good friend and Fox "version of God," Roger Ailes; albeit with a slight divergence on immigration that included a muddled comment about how he sort of supported the profiling that was part of Arizona SB1070. But he can be counted on to support right wing memes including Obama bashing. While the Catholic Church isn't supposed to be endorsing candidates, Morris, rather cleverly, skirted the IRS rule by telling his Fox faithful that he couldn't vote for Obama because he doesn't trust him. Morris has also questioned Obama's Christianity because he doesn't regularly attend church. And then, of course, the fetching father had a hissy fit about Obama's omission of "God" in his Thanksgiving address even though past presidents also neglected the deity who was mentioned in Obama's Thanksgiving Proclamation. But Obama did mention God at the Prayer Breakfast, along with the need to help those in need, and that kind of "social gospel" is anathema to Fox News and the wealthy Christian right, for whom Morris serves as chaplain, who say blessed are the tax cuts and screw the poor. Morris had already pontificated on Obama's heresy over on Fox Business. Fox Nation covered it in their usual derogatory fashion. So, on the Fox & Friends Sunday with Fr. Morris segment, Dave Briggs wanted to know if Fox is blowing Obama's prayer breakfast comments, regarding taxing the rich, out of proportion. Not surprisingly, Morris said "as soon as the government says because god wants you to be responsible if you've been given a lot, therefore now you should give it to us, that's where we've gone wrong. Yes, to whom much has been given much will be expected it does not mean therefore you should give it all to the government and that's where it can be misinterpreted." So Obama gets dissed for not being Christian enough and in this case, for being the wrong kind of Christian. Go figure. 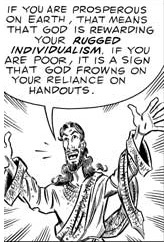 All rise for the reading of the gospel of Supply Side Jesus. Jesus did not oppose the tax system of the day, rather opposed corruption in tax collection and heavily taxing the poor. You can find this message in the Old Testament, too, especially one also studies the social structure of the times. Also, the Roman Catholic church is exempt from the taxation that many businesses are not. His own tax structure, and his employer is grossly unfair. Get out there and be a Mother Teresa, Padre! And that interpretation comes from the fantasy portion of Fr. Jon’s brain wherein a tax rate of 37% is miraculously transformed into 100%. Jesus doesn’t like a liar Fr. Jon.